While we understand that some times people have life situations that leave them no choice but to surrender their animal, it is also true that people surrender for the wrong reasons. All too often we hear that "We just don't think it's fair to the ferret because we don't have enough time in our lives anymore." Or "It was my child's animal and they no longer are interested." As a rescue, we are strapped with enough of the true hardship cases and while we still try to accommodate people in these situations, we find them rather unacceptable for giving up their ferret. What is really not fair, is that this animal to whom you made a commitment to is going to be put in a situation that he or she doesn't want, doesn't understand that also involves losing the people they love. When you allow your child to take on an animal companion, you as a parent become responsible for teaching the child commitment. If that lesson fails, the responsibility for the animal's care is on you as a parent and you should accept this before allowing your child to have ANY animal companion. Please do not misunderstand my words as chastising, but in all honesty, my primary interest is the ferrets, not people that no longer want to be bothered with a ferret they made a life time commitment to. In the six years I have been in rescue, I have changed jobs, been unemployed, lost my mother, undergone serious foot surgery and a host of other life's challenges and STILL maintained our rescue operation of many ferrets, so I am less than sympathetic to people that can't continue to take care of one or two little fuzzys who expect only a few hours of your time. 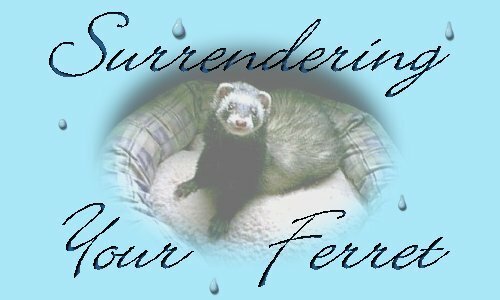 The reason for this page may be the difference between the life or death of your ferret that you intend to surrender. Being turned in to a rescue can be very hard on some ferrets. Because they are such social and bonded creatures (with each other AND you), they would rather stay in less than ideal situations than be uprooted from the life they know and turned in to a rescue. . 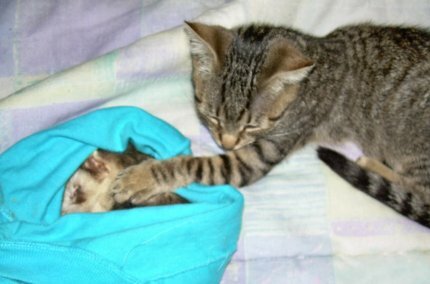 I have seen several ferrets die from shelter stress. I can see it begin with the sadness in their eyes. I was small, afraid and alone when you saw me. You said I was too little to be there alone so you bought me. You said you were afraid, and alone, divorced you said, unloved. But you said you'd love me. We went everywhere together, work, play, movies. Because you said you loved me. You said you met someone, he didn't like me. You took me to a place, you said just for a few days. You came back and got me, took me home. You put me back in that cage days at a time alone. And told you I had to go, I smelled, and so did the cage. You took me back to the shelter this time forever. You said you didn't have time, he was there. I was scared, and alone again. And all because you said you loved me. I just want to sleep, the vet is confused. How can a healthy ferret be so ill? A broken heart is what I have. You see I chose not to live, I chose to wait at the bridge. I can not live without you, and there I will wait. Shelter Mom cries, she said she loved me, too. Remember this, I will always love you. bridge because of broken hearts. What is shelter stress? Coming in to a new place with lots of new ferret smells and suddenly, for no reason, they are no longer with the people that they love. Where did they go? What did I do wrong? Why don't they love me anymore? All of these things go through their little minds and when they become severely depressed they develop stomach ulcers and begin bleeding internally. Can't stress be cured with medications? Partly, yes. Medications can be used to stop the bleeding ulcers but it doesn't stop the stress and depression they feel. We also work with herbal tonics to try and control the depression. Even with forced syringe feedings, they can still starve themselves to death and this affects ferrets of all ages. I can't tell you how many times I have sat with one of these fur kids in my arms all night, cooing and coddling them, telling them it will be alright only to have them refuse anything I give them…. including love. They literally take their little paws and push themselves away from you, turning their heads and push themselves to the farthest end of the sleep sack. They refuse ferret friends, even if they came in with a mate and just want to be left alone to die. As a rescue, we deal with a lot of death but these are truly the saddest cases of all and my heart breaks with them. Many of these fur kids have so much life to look forward to but sadly it will come to an end entirely too soon just because their people have turned their backs on them. So please, please consider this before surrendering your ferret,…or any animal. 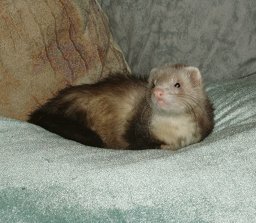 They will roll with a lot of your life's changes better than you think and if you need suggestions on rolling with your life's changes and challenges while maintaining the care of your ferret, we are more than willing to provide help and advice.For the sake of their precious lives this needs to stop. Please, please do your best to honor the commitment you made to your ferret when you made them a member of your family. They ask for so little but give so much in return. Remember all the times you were sad and his little dance brought a smile to your face and give them back the love they have given you. Honor your commitment to them….that is what is truly fair. who's lives were cut short from broken hearts. as our foster kitten Catarina touches him with an outstretched paw. unable to find the guts to even take him in to the building and surrender him properly. All information on this site is copyright protected and may not be used without permission of the author.